Just a quick short post here that I suspect will save a lot of you guys some time googling around and trying to find a Spanish dictionary and online verb conjugator that your like–I’ve tried a bunch of them, I’ve used Google Translate (too simple, often has just one word definitions, that’s just not enough), Word Reference (ok, but the interface is a bit difficult to use compared to what I’m currently using), Merriam-Webster, etc. etc. My personal favorite online Spanish dictionary AND translator (they’ve got both right there, one right under the other, so you can look up a single word or translate a whole sentence or paragraph on the same page) is SpanishDict.com–easy to use and their definitions are the best I’ve seen yet, plus they offer three different translations (one from Google, one from Babelfish, and one from FreeTranslation), and the translator has a button for Spanish to English and right next to it a button for English to Spanish, so again, no need to navigate away, mess around with drop-down menus and selecting the right settings, etc. Super, super easy and very fast to use. My favorite verb conjugator is Verbix: you type in the word you want conjugated, you hit enter, you are shown a full table, logically organized and easy to read, of the entire conjugation of the verb you just entered. That’s it. Beautiful simplicity. SpanishDict also has a verb conjugator, and it’s a toss-up which one is better because it roughly does the same thing in the same way, I just thought I’d throw in a couple options there so you can look at both and decide based on your own personal preferences (I must admit I think the SpanishDict one is a bit prettier). 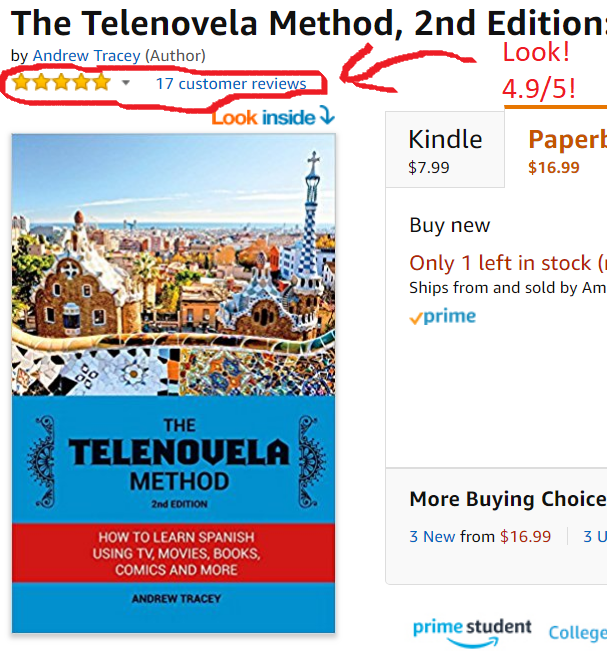 I have a whole method and a book I wrote about it called The Telenovela Method where I teach you how to learn Spanish from popular media like TV shows, movies, music, books, etc. that you can all find online for free. It was the #1 new release in the Spanish Language Instruction section on Amazon for nearly a month after it came out and currently has 17 reviews there with a 4.9/5 stars average. It's available for $7.99-$9.99 for the e-book version depending on who you buy it from (Kindle version on Amazon is now $7.99) and $16.99 for the paperback (occasionally a bit cheaper, again, depending on who you buy it from). What's the Hardest Part? Speaking, Listening, Reading, or Writing? Where to Start?